The children make traditional Polish paper cutouts to learn the power of symmetry in design. For ages 6 to 13. Plan 1 to 2 sessions. Click here, here, and here to see examples of Leluja paper cutouts. 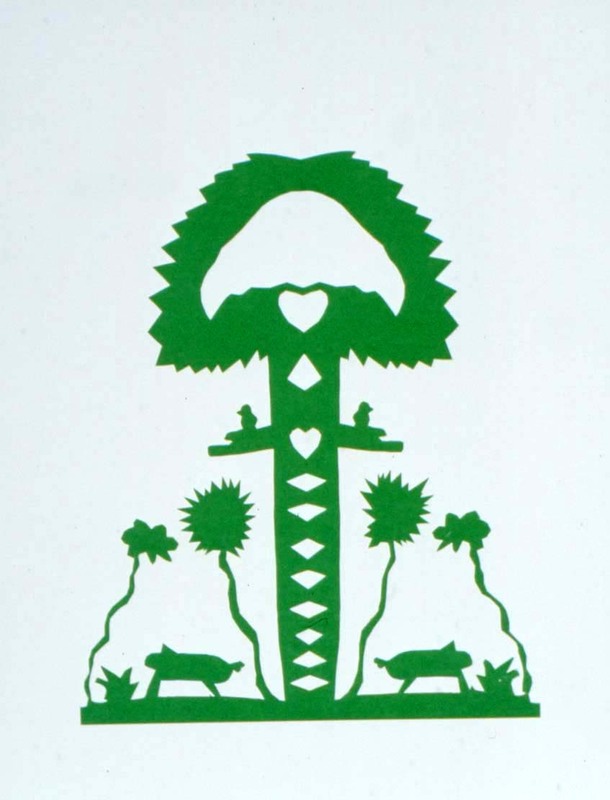 Various forms of paper cutouts called wycinanki (vĭ-chee non-key) originated in the 19th century in Poland. Each spring the people white-washed the walls of their homes and decorated them with the colorful cutouts. 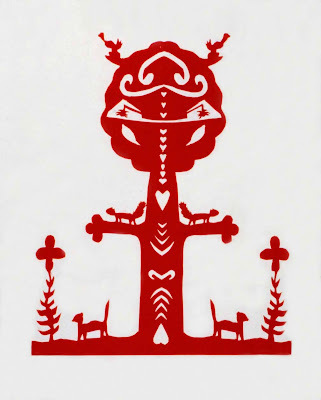 Two styles that developed in the northern area of Warsaw are gwiazdy (g-vee-azda), cut from a round piece of paper, and leluja (le-lu-ya), cut from paper folded lengthwise. 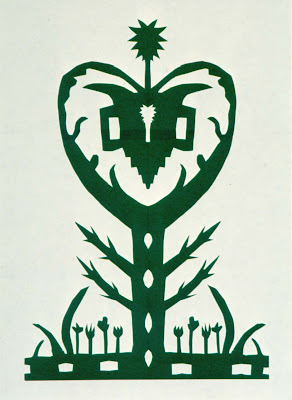 In this lesson the children will learn about leluja cutouts which usually include an abstract, or simplified, tree-like form in the center with a pair of birds or roosters near the bottom. These cutouts are often embellished with fanciful flowers, leaf shapes, and/or geometric patterns. When the papers are unfolded a symmetrical design is revealed. Although these cutouts are still pasted to the walls of farmhouses in some rural villages, they are now mostly made for framing. Set out colored paper, pencils, and scissors. 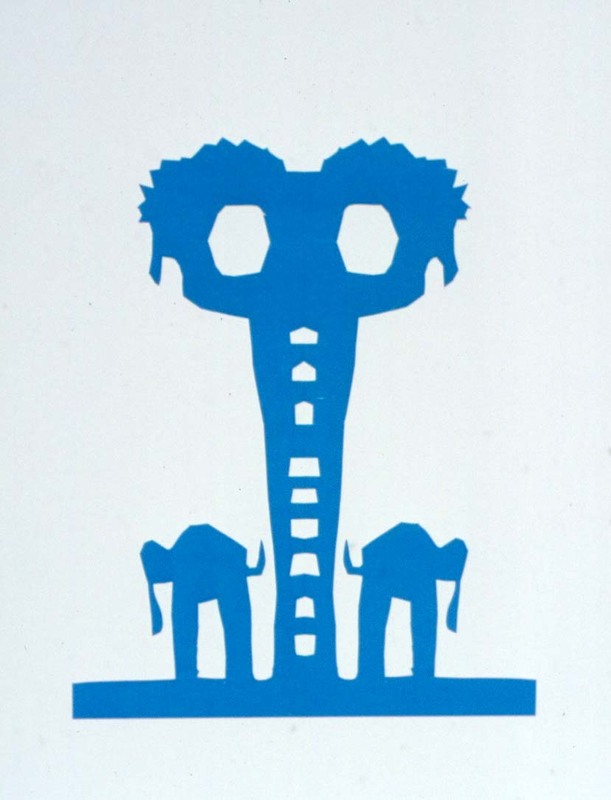 Have available examples and/or pictures of leluja paper cutouts. Share the examples of leluja paper cutouts, pointing out their traditional designs and symmetrical, or evenly balanced, patterns. 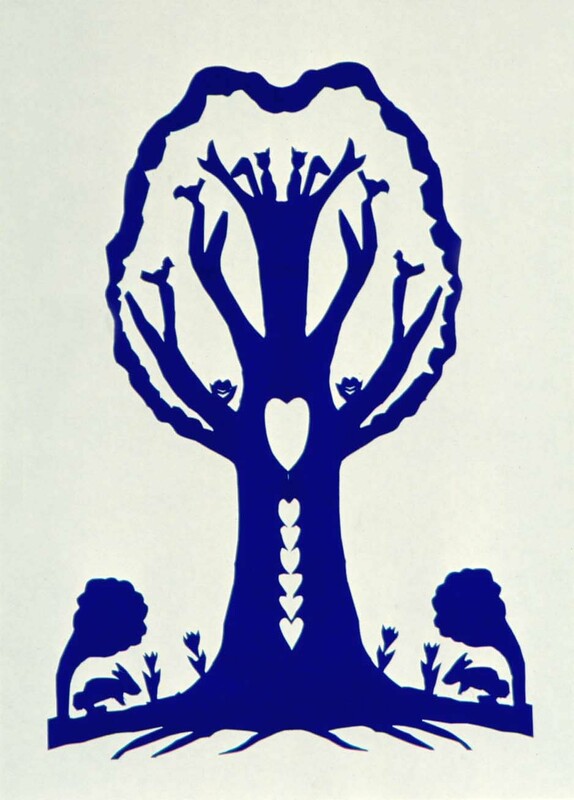 Explain to the children that they will be making cutouts similar to those made by the Polish families. Demonstrate how to make a leluja cutout by folding the paper lengthwise, making sure that the edge is even and the colored side of the paper is folded toward the inside. Begin drawing from the folded edge of the paper which will become the center of the design. 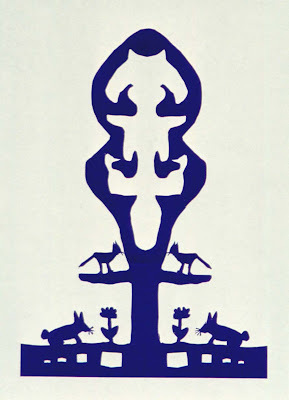 Explain that only half of the tree-like form in the center needs to be drawn because when the paper is opened it will reveal a mirror-image, or the other half. In order to keep the cutout in one piece, the line around the outer edge needs to be one continuous line that never intersects itself or cuts across the fold. Lightly shade the areas that will be cut away to ensure that the design will remain in one piece after cutting. When all cutting is completed, open the folded paper to reveal the symmetrical design. Have the children fold their papers, and then draw and cut out their designs. Note: The children can use glue to mount the cutouts on the white paper, however spray adhesive (applied by an adult) is better for holding the edges flat. Trim the white paper leaving a one- to two-inch border around the cutout. It’s important for the children to see an example of leluja in order to understand the arrangement and abstract tree-like form. Brightly colored Fadeless art paper with one white side works especially well for these paper cutouts. Construction paper is too thick for the children to cut the intricate designs. The darker colors of paper make the strongest images when contrasted against the white background paper. When working with younger children, it helps to staple the corners of the folded paper to keep it from slipping while they cut. The fringe designs on the trees do not need to be drawn. Once the basic shape is cut out, add the fringe by cutting into the edges of the tree. 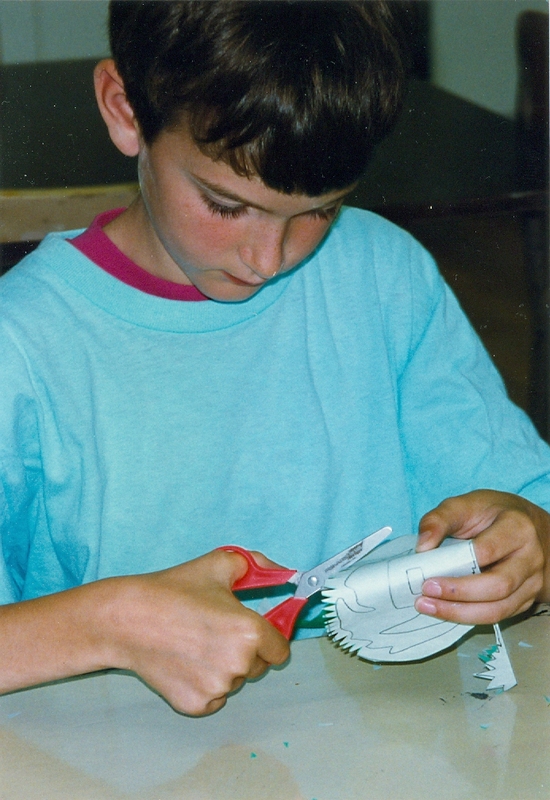 Children often make a series of parallel cuts which close up when pressed flat. To avoid this problem, pieces of paper need to be removed by using either curved or v-shaped cuts. If part of the design gets cut off, it can be saved and glued in place when mounting the cutout on the white paper. The children are always excited when they open their papers and the symmetrical design is revealed. This project is a good confidence builder for children who may be unsure of their abilities in art. Discuss what happened to the original drawings when the folded papers were opened. Point out how mirror-images create symmetrical designs. Do I have to put in a tree? My paper keeps slipping when I try to cut two pieces together. Uh oh...I cut off the chicken in my design. What happened to the fancy fringe I made around my tree? Do I need to use a farm animal? I was thinking of an elephant. The center of your design should be related to a tree shape, but does not have to look like a real tree. I can staple the corners of your paper together to keep it from slipping while you cut out your design. If you accidentally cut off a part of your design, save it to attach later when we glue the cutouts to the white paper. When cutting the decorative edge around the border of your tree, remember to cut out bits of paper from each cut so the design will show up when placed on the white paper. You can decide which type of animals, plants, or flowers you’d like to use in your design.